A fitting which provides protection for the open end of a vent stack, soil stack, or waste stack; prevents objects from being dropped down the stack. Remove each battery cell vent cap and check the electrolyte level with a flashlight. The snap-fit base is easily installed by simply removing the vent cap from each battery cell and pushing the Water Injector valve into place. Lint escapes through tiny gaps around the edges of the dryer drum and falls into the cabinet, especially when the exhaust vent or vent cap is dogged and airflow is restricted. If a vent cap is elevated, follow the guidance in the TB. Life-saving tips for the Hawker! Check the outside dryer vent cap to ensure that it's debris-free. If your battery has a removable vent cap, you should check electrolyte levels at least once a month. 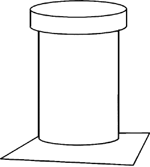 A Y-shaped mark on the vent cap provides visual verification of the closure position. And because it is transparent, the material enables one to see inside the cell jar to determine water levels without having to open the vent cap, the company adds. Figure 2 a shows denting on a roof vent cap indicating that h ail had struck the vent at one time. Also available is an air vent cap ideal for small vent holes and a no-slot cap to completely cover the EDP liner. A rubber disk acts as a door to permit gas to escape through the perforated vent cap.